Hollybeary Creations : FM159 & a fun new technique!! FM159 & a fun new technique!! Friday, Friday... Whoo Hoo! I'm just excited because I don't know about you but this week has draggggeeeedddddd..... I need some serious sleep so Saturday can't get here fast enough!! Anywho time for a new challenge at the Friday Mashup and our hostess with the most'ess is Heidi and she's asking us to use a "Retired Stamp Set" or a " Stamp you haven't used in a while" And we're mashing it up with Stencils!! 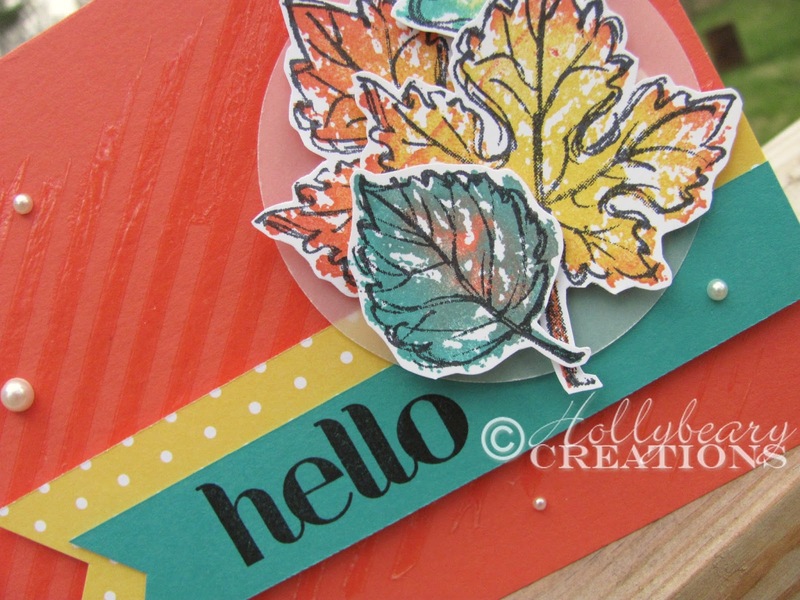 I started with the current Color Challenge over at Create with Connie & Mary... Love this combo! 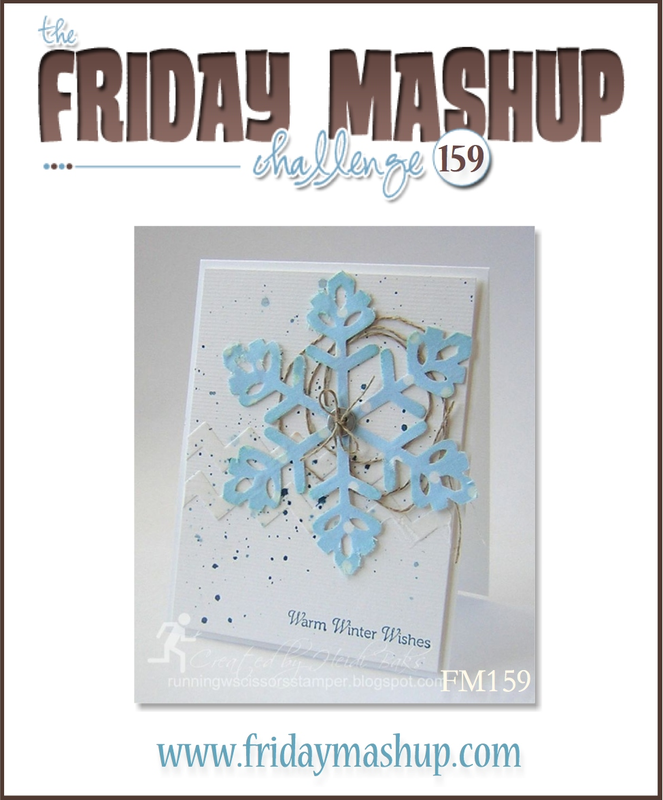 We're using stencils as part of the Mashup Challenge and I don't have any from Stampin' Up! in my stash... so I created my own again with my e-cutter and MDS. I cut it from a piece of DSP backing, I wanted a throw away one. Then I decided to try something different and I used Crystal Effects as my medium over the stencil.. While it worked it was super messy and you gotta work fast because things get sticky really quick.. Ha Ha. This was messy so there wasn't any taking photos during this process... find an old credit card or plastic scrapper you can throw away when you're done. Adhere the stencil over your card front (you want to use DSP backing type card stock because it's thicker), then working quickly squirt some crystal effects in the center and glide it around with the scrapper quickly removing any excess. Carefully life the stencil and let dry.. If you use your heat tool it'll bubble, but it gives it a cool texture. And you want your application to be kinda thin. I stamped several off the leaves from the Gently Falling Set (retiring) in Daffodil Delight & Calypso Coral and then I did one in Daffodil Delight & Bermuda Bay and the small on in Calypso Coral & Bermuda Bay.. Very cool effects from all combos. I stamped the outline in Black so it would Pop!! Then I adhered them to a 2 1/2" circle I punched from a piece of Vellum. I created 2 banners with a piece of Daffodil Delight DSP & a piece of Bermuda Bay card stock. I added the sentiment "hello" from the set Four You. Then I added a few Pearls to finish the card off.. So pretty!! Head over to the Friday Mashup blog and see what the other Design Team members created this week and Link up!!! The challenge is open until Wednesday @ 6pm EST. 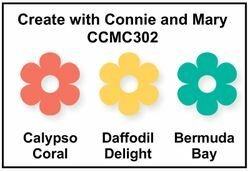 The Create with Connie & Mary color challenge is open until Wednesday @ 12pm EST. I love the colors and composition of your card, Holly. Super cute! Great effects too. Wow! What a beautiful card! LOVE the way you created the background! That is so creative! And the challenge colors on the leaves look beautiful! Thanks for playing the challenge at Create with Connie and Mary! Those leaves are amazing - the blend of colors on each one is beautiful! Such a pretty and creative card! Thanks for joining us this week at Create with Connie and Mary. Very fun use of a stencil!!! Love the way the glossy Crystal Effects looks in the background! And love the variety of colors in the leaves for a very non-fall look! What a fun background idea! Sometimes the best ones are the messy ones! Love your card! The colors in the leaves are just perfect! Thanks for playing the Create with Connie and Mary color challenge this week! I LOVE the leaves in these colors - so unexpected! Thanks for joining us in the color challenge this week at Create with Connie and Mary! AMAZING card! 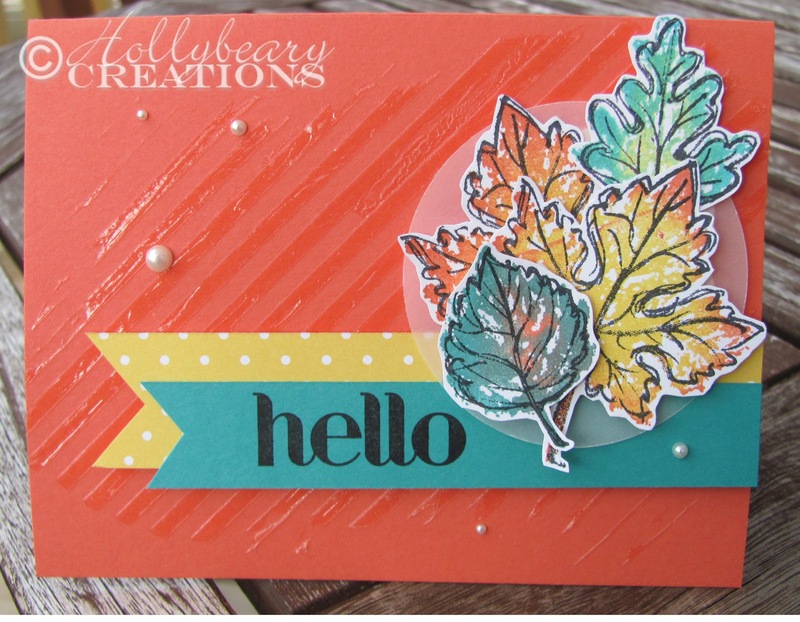 LOVE the background you created and the leaves in these colors are truly AMAZING! I will miss this set! Thanks for playing along this week in the Create with Connie and Mary Thursday Challenge! You are so creative to make your stencil and use Crystal Effects! I love the shiny diagonals; they make such a great background!! The leaves are so beautiful... I'm REALLY going to miss this set!! Thanks for joining us at Create with Connie and Mary this week! This is a fabulous color combination and your coloring of the leaves is truly stunning! Love it!